Brake fern rambles above baby’s tears in a Roost recycled-glass bubble terrarium from Velocity Art and Design ($121; www.velocityartanddesign.com). A narrow conifer seedling shows off its columnar shape in a tall jar (similar Burken jar $5; ). A mini green jungle of five-finger fern, lemon button fern, dwarf mondo grass, and Scotch moss thrives in a Terradome terrarium by Ric Lopez ($85; ). Assorted small succulent cuttings cluster in the Vibe glass canister from the Container Store (42-ounce canister $8; ). 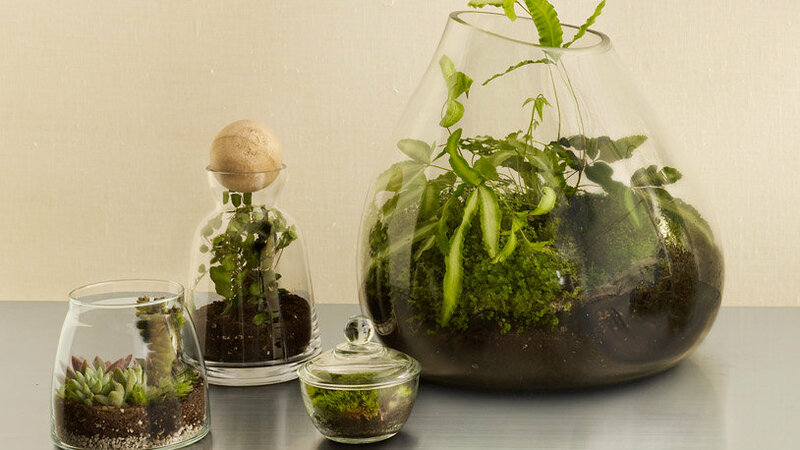 A single button fern fills an Edda carafe with wooden-ball lid from Anthropologie ($38; ). A tiny patch of Irish moss creates a velvety carpet in an Anchor Hocking Presence glass sugar bowl from Target ($3.50; ). A little African violet blooms in the Wall Bubble from Flora Grubb Gardens (from $14; 415/648-2670). ‘Aurea’ creeping Jenny makes a cool but temporary display in an Anchor Hocking Heritage Hill jar—it’ll stay happy as long as it stays small (3-quart jar $27; ). Choose a clear glass or acrylic container, with or without a lid. Almost any size will work, as long as it’s big enough to accommodate your plants. Don’t be afraid to experiment. Spread a 1- to 3-inch layer of charcoal, gravel, or pumice on the bottom of the container for drainage. Add enough potting mix to surround plant roots. Gently settle the rootball into the soil, then firm it into place. Add more soil as needed. To water, gently spritz the soil around plants with a spray bottle, taking care not to overwater. If your plants love moisture, cover the terrarium to maintain humidity, but open it occa- sionally to prevent the buildup of condensation. For drought-tolerant plants such as succulents, keep the container open at all times, and water sparingly. 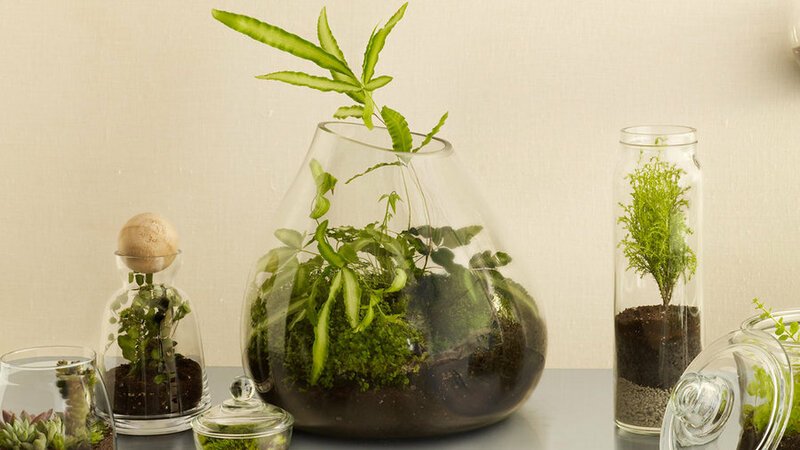 A good place to start looking for terrarium-friendly plants is the indoor section of your nursery. These growers love the humidity a terrarium provides: Ajuga, club moss (Selaginella), Fittonia, Hypoestes, maidenhair fern, miniature African violets and Sinningia, moth orchids (dwarf forms), Peperomia, and prayer plant. From the outdoor section: mondo grass, Scotch and Irish moss, and succulents.